Meditation is a mindfulness practice that can recharge and balance the body and mind, bring about a peaceful state of mind as well as develop our brain potential. It can use the breath, body and mind. It can promote circulation, brain health as well as prevent diseases. Practising meditation can regulate our body, breath and mental activities. It can also promote human blood circulation, get off troubles in daily life and answer some subjective confusion. Thus Meditation is the best choice to improve our health, recharge our own body and mind, develop our brain potential as well as prevent and cure diseases. Meditation can get our brain into a peaceful state, it can make us feel quiet and peaceful so that our Qi channel will be unblocked. Meditation can also remove many diseases from our body. It can improve our intelligence, change our temperament so as to reach a balance of our body and mind. If one often do Meditation, then he will always feel relaxed, active and full of energy. Twin-tray Meditation can open the channels and blood vessels on legs as well as open up the hip joints. The posture of twin-tray Meditation will repress the main artery in the inner thigh, so our heart will work harder to pump more blood, thus it can help to dredge the blood vessels on legs. Also, it can help to improve the function of the internal organs of the body. 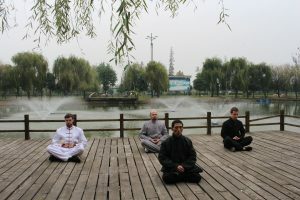 Do you want to do Meditation training?